It may seem early to think about tips for finding a job. You will probably be concentrating on a heavy workload, including a your final year project, so you can get a good degree. However, if you wait until you have your results, you will miss out on many of the graduate opportunities becoming available over the next few months. It’s worth taking a little time to think about your future career now, before the intense work at the end of your time as a student. You may not realise how you have become a valuable commodity. The demographic profile of the population is changing. The number of people in the 18 to 25 year age range available for work is diminishing, as the population gets older. With your degree, you will be a desirable prospect to employers. So spend a little time thinking about what career steps you would like to take at this point. Find out about job fair. While you are still at university, the big employers will come looking for you. See what graduate career fairs are coming up and go along. You could try a local one first, to see how they operate, then choose a couple, which is further afield, in your area of interest. Use the web to research graduate recruitment. There are specialist graduate recruitment websites, as well as more general career advice websites. They can offer information about how to get into the sector which appeals to you, about the transition to working life, how to write a compelling CV and interview tips. You may find, rather than a traditional chronological CV (listing work experience, starting with most recent job) is not the most proper format for you. Another format – the functional CV – may showcase your skills and inevitably limited work experience better. Functional CVs focus on skills, rather than on dates or places of employment. The most relevant information is presented at the start of the CV. 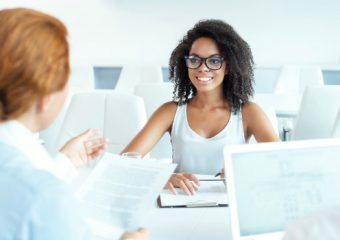 Your first paragraphs will detail your skills and experience, with achievements and reasons to show why you are qualified to move into the career you now seek. Think about the skills you will need in your chosen career. Then find examples in your background which demonstrate these skills. Do you have part time jobs you can use as examples? Have you been a member of a club, or volunteered for a non-profit organisation? Have you got interests outside of studying? All of these can give you examples to demonstrate your existing skills and experience. Interests, if relevant to job or you need to fill some space! Finally, remember to look smart, not cool! And good luck in the first steps of your career.